A chemical peel is a facial treatment to improve and smooth the texture of the facial skin using a chemical solution that causes the dead skin to slough off and eventually peel off. 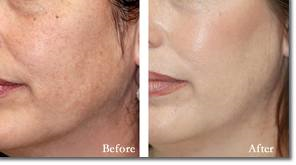 The regenerated skin is usually smoother and less wrinkled than the old skin. The chemical solution removes the dead skin cells and stimulate the production of new skin cells which in turn can reduce /remove skin blemishes or wrinkles, reduce fine lines under the eyes and around the mouth, correct uneven skin pigmentation, and soften acne and acne scars. What to expect during and after the procedure? During the procedure, most patients experience a warm to some what hot sensation that lasts about five to ten minutes, followed by a stinging sensation. Cool compresses may be applied to help alleviate this stinging. Depending upon the type of chemical peel, a reaction similar to sunburn occurs following the procedure. Peeling usually involves redness, followed by scaling that ends within three to seven days.It is important to avoid over-exposure to the sun after a chemical peel since the new skin is fragile and more susceptible to complications.